Thursday 20th February - Honey & Co has been on my list for a very long time, so I was delighted when my Mum picked it out of a bunch of suggestions for a birthday meal. Me and the parentals popped along on a Thursday lunch time to see if it deserved its Michelin Bib Gourmand (for "offering good food at reasonable prices"). Booking is essential! We had a table for 12pm so I expected it to fill up slowly, but clearly the secret is out. Tables are packed pretty close together, so you may end up chatting to your neighbours about how delicious everything is. N.B. Honey & Co. is closed on Sundays. We all went for the bargain lunch set menu (£15.50 for Mezze and a main) and a refreshing glass of home-made mint lemonade. Orange-blossom iced tea & Camden Hells Lager were tempting but we made the right choice. The Mezze was outstanding - I'm always happy eating endless piles of pitta, but this was next level stuff. The creamy hummus and courgettes disappeared first but everything deserved its place. We agonised over mains for a long time before finally deciding on Fasenjan (slow cooked duck in walnut & pomegranate sauce, spiced split peas), Mafroom (celeriac stuffed with lamb & herbs, slow cooked in a lemon saffron sauce) and Patlijan (slow cooked lamb and aubergine stew wrapped & baked in crispy pitta). Grilled octopus and prawn & fennel tagine will have to wait until next time. The Fasenjan won it for me - beautifully cooked duck with subtle flavours - but only just. The delicious stuffed celeriac was a new experience, I wonder if I might see it recreated at home soon. This brings us to dessert. Choosing the main was tough, but at least our rejected options weren't staring us in the face! There are three puddings listed on the menu, but there are also 10 or so more cakes sitting on the counter. Despite expert descriptions from our superb bubbly waitress, we went on a couple of cake recces before we eventually made our minds up. Warm marzipan cake with roasted pink rhubarb and sour cream was a big hit - marzipan-haters need not fear it, we would have described it as almond. The attractive creation you can see below is my wonderful Cold cheese cake with Kadaif pastry, Greek pine & fir honey - just what was needed after all the slow cooked meats. Our meal was faultless from start to finish, and my parents have already booked in for a return visit. It is a labour of love for married couple, Itamar Srulovich & Sarit Packer, who first met working in a restaurant in Tel Aviv. They have both since worked for Ottolenghi, Itamar as a head chef & Sarit as a pastry chef, and their experience shows. Keep an eye out for their first book which is coming out in June and can be pre-ordered on Amazon, and don't leave without buying some of their deli products! Friday 21st February - The day after Honey & Co. had been reserved for Craft Beer Rising for about 6 months. It conveniently marked one year of the blog - The List covered 325 places in 356 days in its first year. The Christmas holidays scuppered my hopes of averaging 1 a day, but it's not too shabby a total. Natalie, Lauren & Luke took the top spots on Team List and will receive some prizes at The List one year party in a couple of weeks which might have a couple of spaces going - keep your eyes on my twitter feed @matthew1hickman. 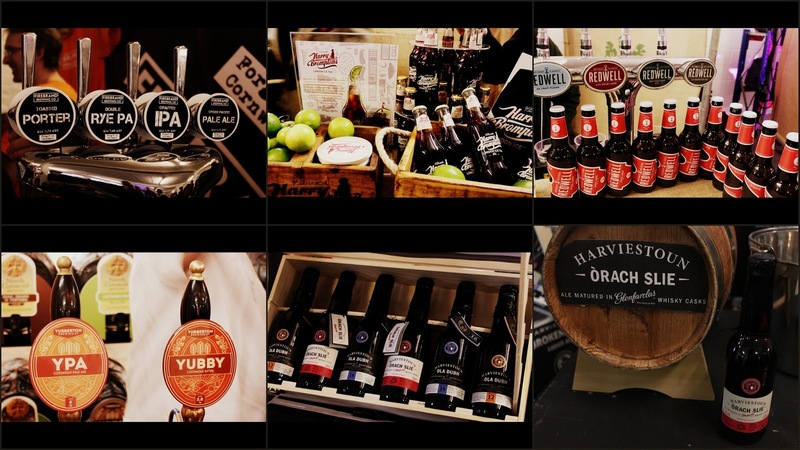 Craft Beer Rising took over Old Truman Brewery from 21st-23rd February, packing over 75 breweries and 450 beers into a few rooms along with some top street food and DJs including Mr.Scruff. I'm going to find it hard it hard to mention everything so here are some highlights! 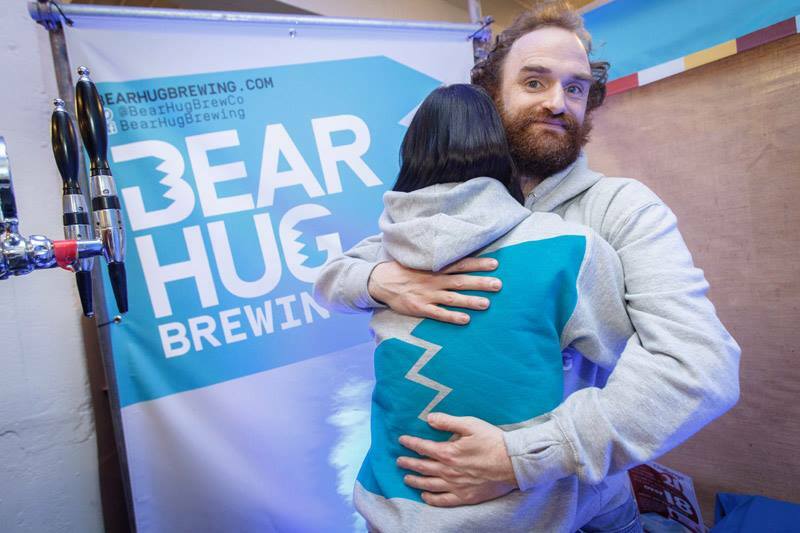 Bear Hug Brewing - Launched at Craft Beer Rising with a superb Hibernation White IPA. I love their Bear Hug branding! Every time you buy a beer, you also preserve 1 sqft of rainforest which you can check on here. Harviestoun - They revealed a limited edition unhopped whisky-barrel-aged lager called Orach Slie - aged in casks from Glenfarclas distillery for 6 months. Not your average beer! Firebrand Brewing Co - excellent craft beer from Cornwall including Chateau Civrac 7.5% Old Ale. They were also showing off their "Randalizer" gadget for dry-hopping beers, taking away the bitterness to convert a new wave of beer drinkers. Redwell Brewery - I just love their beers, especially the Steam Lager. Even more so after they fought off Redbull after a ludicrous legal argument. Harry Brompton's Alcoholic London Ice Tea - Not a beer at all but very refreshing, it will come into its own in summer - makes you wonder why nobody has thought of it before? London Velvet - London Porter Ale meets West Country Fine Cider - very easy to drink, especially when poured through an ice luge! It dates back to the 1890s when William Sharvatt first created this half & half drink which he described as "tasting like pure velvet". 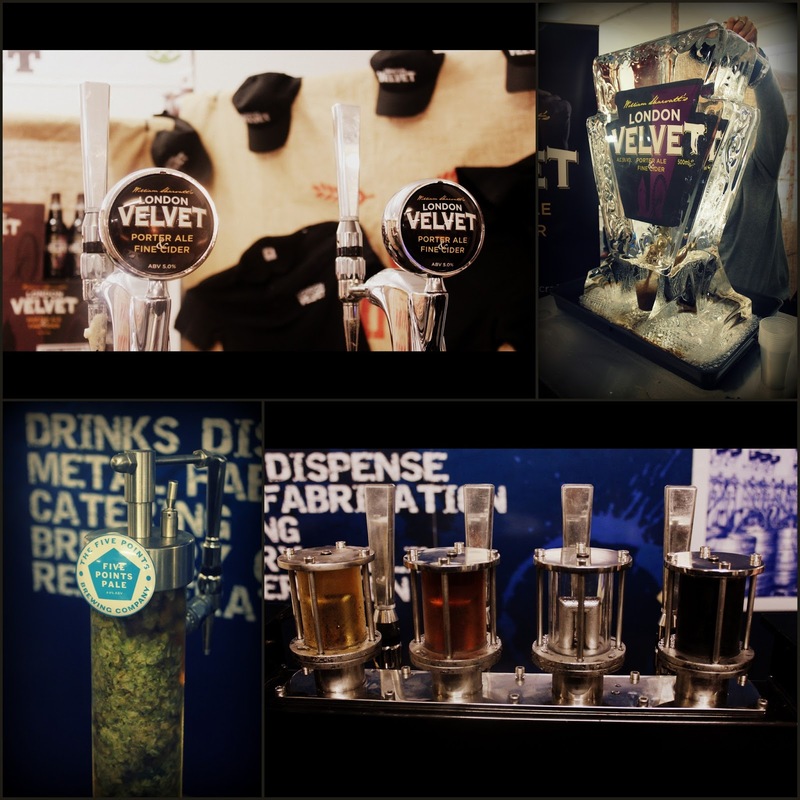 Atalantic - They, amongst other things, create clever pieces of kit for infusing beers with more flavours at the last minute - e.g. a blast of coffee beans. I also liked the bar top device which displays the colour of your beer before you order it. Atlas Brands Ltd - These guys showcased some fantastic Italian beers. The stand out was Brewfist Spaceman IPA, but Birra Del Borgo My Antonia was also top notch. Who knew? Time for a holiday. 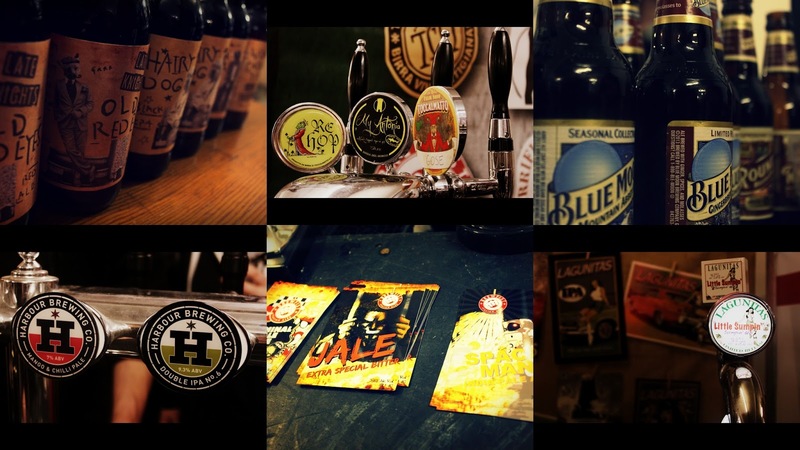 Camden Town Brewery - Launched a tasty new Beechwood Smoked Rauchbier called Flue Faker. I seem to run into Camden Beer every other day around London! Batemans Bohemian Brews - I liked their cheeky "Craft Brewers since 1874" dig at the new generation. They had some bonkers "Bohemian brews" on show including a Black Pepper Ale which has pepper ground into it after pouring - it shouldn't work but it did, even it was a little crunchy. They also do Hazelnut Brownie, Mocha Amaretto and Orange Barley beers. Beavertown Brewery - Duke's Brew & Que BBQ & Beavertown beer joint is one of London's must-visit places. Beavertown are moving to a bigger brewery site slightly further out of London, but Duke's is staying put - don't worry! They are launching their awesome Gamma Ray beer in canned form soon - will this be the year of the cans? Revisionist Beers - Marston's brewers have been given free range to make an exciting range of beers with friends from Park & Wychwood getting involved too. The beers will be going in to Tesco's exclusively very soon, if they haven't already! 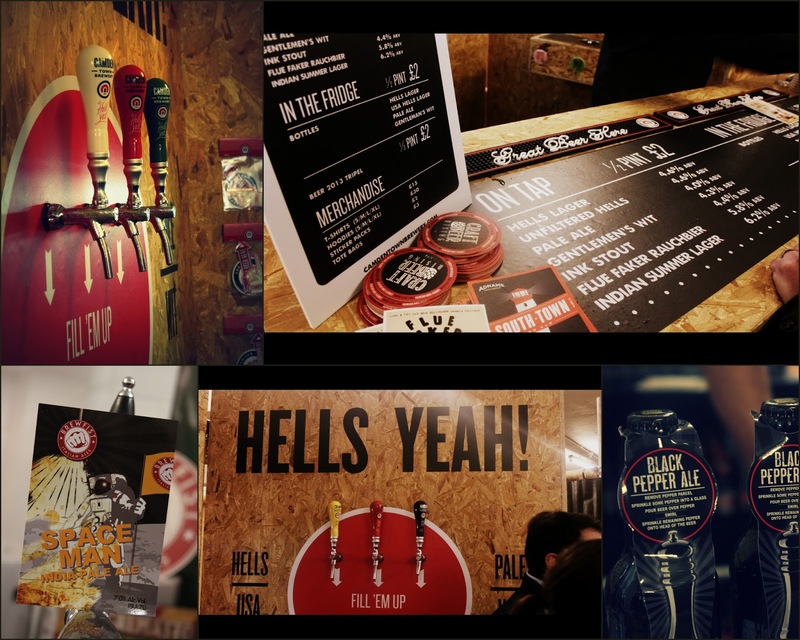 There were many more fantastic beers including Maverick cans, Crowded Hops and more from Brains Craft Brewery, top Point & Roscoe beers brought in by American Craft Beer Co, not to mention Brewdog, Bristol Beer Co, Harbour Brewing, By the Horns, West Brewery, Lagunitas & St.Austell etc. It was beer heaven. Thankfully they had an awesome array of street food to soak up some of the beer including Prairie Fire BBQ, Hix Fishdog, Burger Bear, Fleisch Mob and Dosa Deli. If you didn't make it this year, make sure you keep an eye out for the next one. In the meantime (BEER PUN ALERT), watch this little taster video from the fun guys at Craft Beer Channel (email users click through to the blog to view the video). Tuesday 18th February - Last but not least from half-term was a fabulous boozy evening of Cava & tapas tasting at Copa de Cava near Blackfriars. Tucked away underneath Camino is a cava-lovers hideout overseen by the incredibly knowledgeable & friendly owner, Richard Biggs, who is also responsible for Bar Pepito in King's Cross. There are 10 grape varieties from which cava can be made (answers on a postcard) and the fermentation method in deep underground tunnels & caves give cava its name. The usual suspects (Wilkes, Leyla, Laura, Clerkenwell Boy, Faerietale Foodie & co.) were all along for the ride, which involved 9 courses and 10 bottles if I kept count correctly. 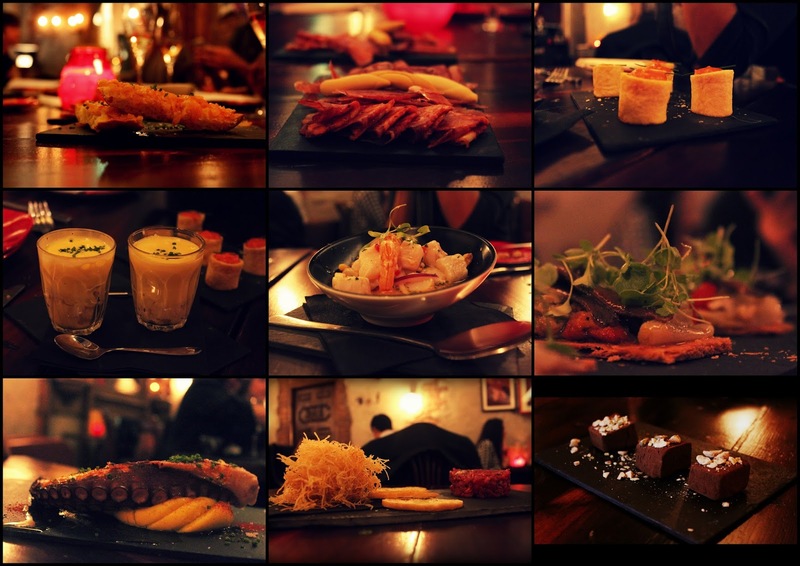 The tapas was well matched throughout the evening, and there were some quirky twists on classic dishes. Patatas Bravas turned up in cylindrical form (see top right below), Tortilla Siglo XXI was presented in a large shot glass, a Pulpo (octopus) tentacle appeared suckers and all, and Steak Tartare came with its own smoking jar. The cava kept coming, and Richard very generously opened up some very fine stuff at the end including Kripta Gran Reserva Brut Nature which is normally £85 for a ridiculous shaped bottle. If you can't make your mind up, there are cava flights, or you can go all out and get the £60 cava & tapas tasting menu. There is a cheaper £30 tasting masterclass too - the next one is on March 25th. All of their cava is available to buy at takeaway prices too, and on "Cheap Mondays", you can get a second glass up to the same value for free all night, and all bottles are set at their "to go" price. Thanks to Sauce Communications and Richard for hosting such a wonderful evening. Richard is incredibly passionate about what he is doing and it really shows - well worth a visit!